Whether you’re a beginner or an expert chef, every kitchen can use the Damasukasu Japanese 3-Piece Master Chef Hanshu Knife Set. Made using the methods of traditional Samurai swords, the 3 piece set includes a basic 7-inch Nakiri vegetable knife, a precise 8.5-inch slicing knife, and a strong 5-inch utility knife. All three knives are on sale today for 65% off the normal price. The hand-made creation process ensures the knives are immune to stains or rust. From a previous sale price of $199.99, you can buy the set for only $69.99. 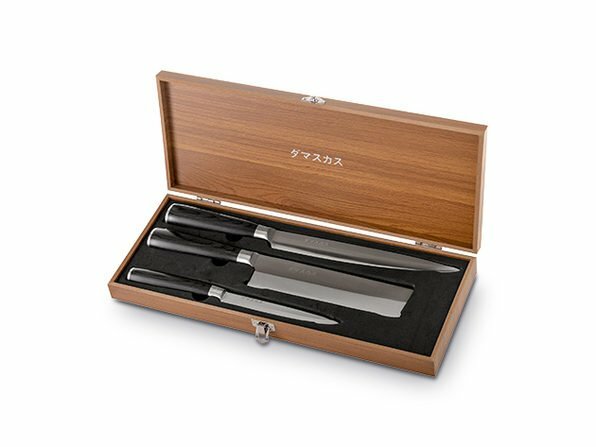 The makers of the Damasukasu Japanese 3-Piece Master Chef Hanshu Knife Set are so confident of the set’s quality, it has a 100-year guaranty. Similar knife sets cost as much as $300 from trusted retailers like Williams-Sonoma. Only a limited number of knife sets are available due to the labor-intensive creation process. To take your cooking to the next level, buy the Damasukasu Japanese 3-Piece Master Chef Hanshu Knife Set in the Daily Caller Shop for $69.99, 65% off the already reduced sale price by clicking here today. Get an extra 20% off with the Black Friday coupon code BFSAVE20.